Click on the thumbnails below to see the monthly logbooks for the previous year, or follow the link to the right for the complete index. The drake Canvasback x Pochard was still in Stratford Bay today, as were 18 Snipe, a Water Rail and a Water Pipit. The drake Greater Scaup x Tufted Duck was at Moreton hide, with a Chiffchaff, two Stonechats and the first Jack Snipe of the winter nearby. The adult drake Greater Scaup x Tufted Duck was with a large Aythya flock at Denny this morning. The 'interesting' duck theme continued today; the Aythya flock at Moreton this afternoon held the presumed drake Pochard x Ferruginous Duck, the adult drake Greater Scaup x Tufted Duck and two first-winter male Greater Scaups. Stratford Bay added to the misery with the returning drake Canvasback x Pochard (plus a single flyover Water Pipit). Goosander numbers have increased to 28 today, and the Red-breasted Merganser has reappeared. Stratford Bay produced the drake Pochard x Ferruginous Duck, a Green Sandpiper, one Water Pipit, a Kingfisher and 15 Snipe. Three Stonechats were at Heron's Green Pool. The Pochard x Ferruginous Duck was still in front of Moreton hide today, and an adult Peregrine was seen along Moreton Bank. The Bittern was seen at Herriott's Pool at 16:31 this afternoon. At Stratford hide this afternoon there were at least eight Water Pipits, three Snipe and a Kingfisher, as well as c.300 Lapwing and the hybrid drake Pochard x Ferruginous Duck. An adult Mediterranean Gull was in the roost off Nunnery Point, and the Bittern was seen again at Herriott's Bridge this afternoon - it flew along the east side of the pool at 16:33 (it had been in the extreme NE corner by the road). A Greylag was with the Mallards at Picnic Site No.1 today. Water Pipits continue to be seen around the lake; there were singles at Spring Bay and Twycross today. The latter location also produced a Chiffchaff, with a Green Sandpiper nearby at Hollow Brook. A Little Egret flew over Herriott's Pool. The drake Pochard x Ferruginous Duck was still in Stratford Bay, as were three Water Pipits. A Chiffchaff was behind Stratford hide, and a pair of Stonechats was still on Moreton Bank. At least one Water Pipit was seen in flight over Stratford hide this afternoon. The drake Pochard x Ferruginous Duck was in Stratford Bay this afternoon, and an adult Mediterranean Gull was in the main roost. Stonechats seem to be present in good numbers at the moment - today there were eight or nine along the west side (one Villice, two Nunnery Point, two Heron's Green Pool and at least three Moreton Bank). Fieldfares and Redwings are also in good supply in the Moreton and Parkland areas; a flock of c.30 Meadow Pipits at Villice/Parkland was also notable. Water Pipits are also still quite easy to find at either Stratford or Moreton hides; the latter location also produced what appears to be an adult drake Pochard x Ferruginous Duck. Photos can be found at Paul Burrows' Nature Photography. Continuing the hybrid duck theme, the drake Greater Scaup x Tufted Duck has reappeared in Villice Bay. Two Ravens flew high over Moreton hide, and a Green Sandpiper was in Heron's Green Bay. Still no sign of the Red-necked Grebe today, although the Bittern was again seen this afternoon (at 16:46). Four Water Pipits were in front of Moreton hide, and four Stonechats were on Moreton Bank. Good numbers of thrushes were seen again today, along with two Blackcaps. The latter were most likely late migrants rather than wintering birds - this species does not occur at Chew in winter. A first-winter male Greater Scaup was off Nunnery Point today, unlike the Red-necked Grebe, which was nowhere to be seen. A count of at least 13 Water Pipits (four Moreton, seven or nine Stratford) was a good number, although there are likely to be others elsewhere, for instance along the east side of Stratford Bay. The White Wagtail was still in front of Moreton hide. The Red-breasted Merganser was still present, but only six Goosander continued this species' poor showing. 16 Snipe and a Water Rail were on Heron's Green Pool, an adult Mediterranean Gull was seen from Herriott's Bridge, and a total of 48 Goldeneye was counted. Both the Red-breasted Merganser and Red-necked Grebe were both still present, as were the Water Pipits in front of Stratford hide, and a late White Wagtail in front of Moreton hide. Other passerines included lots of Redwings and Fieldfares, and a new pair of Stonechats has appeared at Nunnery (the Moreton Bank pair are also still present). A Peregrine was at Moreton, and the Bittern appeared at Herriott's Bridge at 16:53 this afternoon. The Red-necked Grebe was still off Nunnery Point today, and the Red-breasted Merganser was still in Heron's Green Bay. Noteworthy today was a group of three Grey Plover which flew north over the main dam at 10:15 - they're something of a rare bird at Chew in recent years, although a flyover sighting is pretty typical of this species at the best of times. A first-winter Mediterranean Gull was in Heron's Green bay late this morning, with a Redpoll over Nunnery and a Chiffchaff at Stratford. Five Water Pipits (two Moreton, three Stratford) were also still present. Unsurprisingly, no sign of the Grey Phalarope today. However, the Red-necked Grebe remained off Nunnery Point, and the female/first-winter Red-breasted Merganser was in Heron's Green Bay again this afternoon. A Raven was around Moreton Copse. The Bittern was seen again from Herriott's Bridge at 16:19 (earlier than of late) - it may have been disturbed by a small Starling roost which had formed in its favoured patch of reeds on the north-east side of the pool. The adult Red-necked Grebe was still showing well off Nunnery Point this morning, but a surprise discovery was a first-winter Grey Phalarope there as well. It eventually relocated to an area south-east of Woodford Bank, although proved a little mobile at times. A Red-breasted Merganser in Heron's Green Bay was also new in. There were at least seven Water Pipits showing at close range around the pool in front of Stratford hide this afternoon (along with one Meadow Pipit), and an adult Mediterranean Gull was on Herriott's Pool. The Bittern was again seen in flight from Herriott's Bridge late this afternoon. More of the same today - the Red-necked Grebe was still at Nunnery Point, two Water Pipits and a Green Sandpiper were at Stratford hide, and the female Stonechat was still on Moreton Bank. 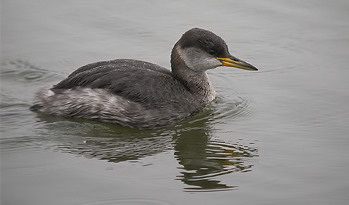 The Red-necked Grebe was still off Nunnery Point, and a female Common Scoter was also on the main lake. The Red-necked Grebe was still showing at close range off Nunnery Point today; other new birds included an unusually late group of four Greenshank with half-a-dozen Black-tailed Godwits in Stratford Bay. The pair of Stonechats were still on Moreton Bank, with a Peregrine nearby; small numbers of Skylarks continue to move overhead. The Bittern was seen in flight at Herriott's Bridge at 16:58 this afternoon. Potentially the best record though was an unconfirmed report of a Pomarine Skua flying over yesterday - there is only one documented CVL record. Just as the weekend is over, two good Avon rarities appear. A Red-necked Grebe just off Nunnery Point this morning was an excellent find, as was a ringtail Hen Harrier which drifted over Stratford hide at 13:00. Also three Little Gulls (two adults and a first-winter), six Water Pipits and a late Common Sandpiper still present. Some moth news, too - a Sprawler on the wall at Woodford Lodge was the first record for the lake of this locally hard to find species.